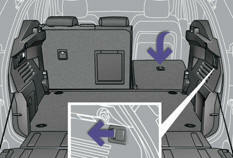 Bench seat the left-hand (2/3) or righthand (1/3) section of which can be folded to adapt the boot load space. Pull the head restraint fully upwards. Never drive with rear passengers when the head restraints are removed; the head restraints must be in place and in the high position. Each section of the bench seat (1/3 or 2/3) has its own control to release the seat back and its seat cushion from the boot. Check that nothing is preventing the seat back from folding (head restraint, seat belts, ...). Pull the control from the boot. 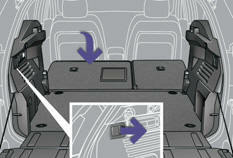 Place the head restraints in the low position or remove them if necessary. 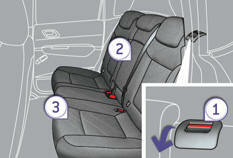 Pull the control 1 forwards to release the seat back 2 which tilts easily onto the seat cushion 3 . 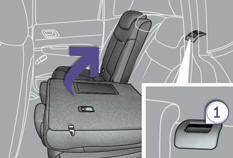 Put the seat back in the upright position and secure it, the seat cushion also returns to its original position. Check that the red indicator, located at the control 1 , is no longer visible, Refit the head restraints or put them back in place. 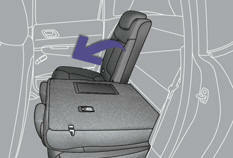 The seat cushion lowers to be covered by the seat back; this leaves a fl at boot floor, if the adjustable floor is in the intermediate position.